Palm Springs Walk of Stars adalah sebuah walk of fame di pusat kota Palm Springs, California, dimana "Golden Palm Stars", yang menghormati berbagai orang yang tinggal di kawasan Palm Springs raya, ditempatkan dalam trotoar pinggi jalan. 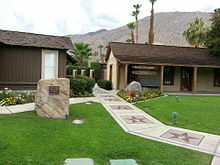 Jalan tersebut meliputi bagian-bagian dari Palm Canyon Drive, Tahquitz Canyon Way, La Plaza Court dan Museum Drive. Beberapa orang yang dihormati adalah Presiden Amerika Serikat, pembawa bisnis acara, figur kesusastraan (pengarang, pembuat drama, penulis latar), pelopor dan pemimpin sipil (pemukim awal, kepala suku, tokoh masyarakat), humanitarian, dan penerima Medal of Honor. Palm Springs Walk of Stars didirikan pada 1992 oleh Gerhard Frenzel dan Barbara Foster-Henderson. Upacara induksi pertama diadakan pada 26 Februari 1992, dan dihadiri ketua Walk of Fame Johnny Grant. Lima Golden Palm Stars pertama didedikasikan kepada Earle C. Strebe, William Powell, Ruby Keeler, Charles Farrell dan Ralph Bellamy. :13 Pada Mei 2017, sponsor Walk of Stars dan Kota Palm Springs mengumumkan penundaan sementara terhadap pemasangan bintang baru sesambil mereka meninjau ulang kriteria seleksi. ^ Most of the names listed are available at Palm Springs Walk of Stars: By Date Dedicated. Additional references and notes are provided to give more background and/or substantiate Golden Palm Star listing. ^ Mitchell, Gordon "Whitey" (2006). Star Walk: A Guide to the Palm Springs Walk of Stars. Palm Springs, CA: Hall/Sloane. hlm. 138. ISBN 978-0-9638683-4-3. OCLC 810234068. Gordon Mitchell's book gives a listing of 300 Golden Palm Stars dedicated through 2006. Only a portion of those names are used in this reference. ^ Frenzel, Gerhard G. (1999). Portrait of the Stars. Palm Springs, CA: Palm Springs Walk of Stars. hlm. 185. LCCN 98093956. OCLC 41260876. Frenzel was one of the founders of the Walk of Stars and his book gives a listing of 139 Golden Palm Stars dedicated through 1998. Only a portion of those names are used in this reference. ^ Mitchell, Marilyn (2011). Walking With The Stars. BearManor Media. hlm. 220. ISBN 978-1593936617. Mitchell's book gives a listing of 48 various Golden Palm Stars dedicated between 1994 and 2010. Only a portion of those names are used in this reference. ^ Descant, Skip (May 22, 2017). "Why there will be no more additions to the Palm Springs Walk of Stars, for now". The Desert Sun. Palm Springs, CA: USA Today Network. Diakses tanggal 24 May 2017. Bogert, Frank M. (2003). Palm Springs: First Hundred Years. Palm Springs, CA: Palm Springs Library. hlm. 288. ISBN 0-9618724-2-X. OCLC 17171891. Johns, Howard (2006). Hollywood Celebrity Playground. Fort Lee, NJ: Barricade Books. hlm. 320. ISBN 978-1569803035. LCCN 2006047650. OCLC 69104355. Turner, Mary L.; Turner, Cal A. (photographer) (2006) . Beautiful People of Palm Springs. Turner. hlm. 154. ISBN 978-1-4116-3488-6. OCLC 704086361. Wenzell, Nicolette (January 2, 2016). "Palm Springs has rich history of celebs, architects". The Desert Sun. Gannett Satellite Information Network, Inc. Diakses tanggal 12 January 2016.